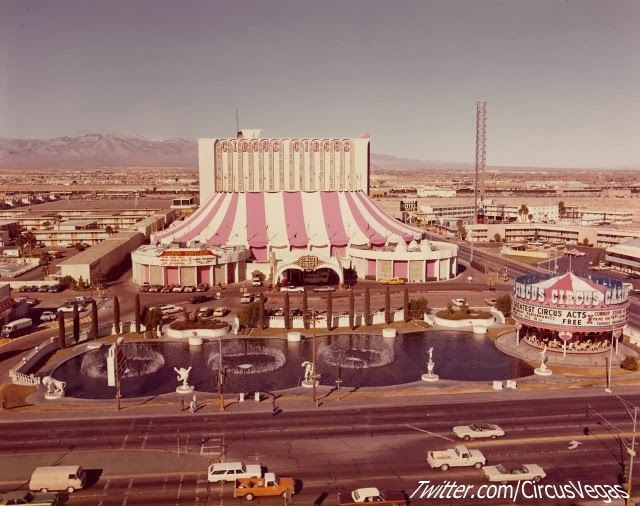 This weeks winner goes to @CircusVegas for its Flashback Friday picture of Circus Circus in 1975. 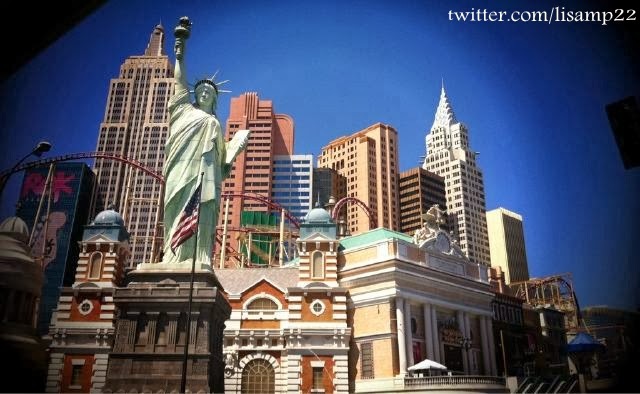 The picture shows the original Circus Circus carousel marquee as well as the strip front fountains. 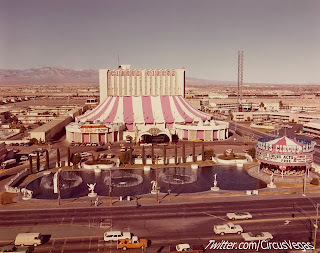 In 1975, just 7 years old, Circus Circus was under new management, just opened an expansion to the hotel and was on its way to become in the most profitable property in Vegas by catering to the low roller. This picture just took me right to 1975 Las Vegas. It was fascinating to see a building I’m so familiar with in a setting I wasn’t alive to experience. This week’s winner comes to us from a listener in Australia and a new member to the twitter community, @miffo34. It’s a picture of the Vegas strip taken from the south crosswalk in between MGM and NYNY. How he got this picture without including the dirty, smuggled and nicked up Plexiglas all of my pictures have from the same place, I’m dying to know. 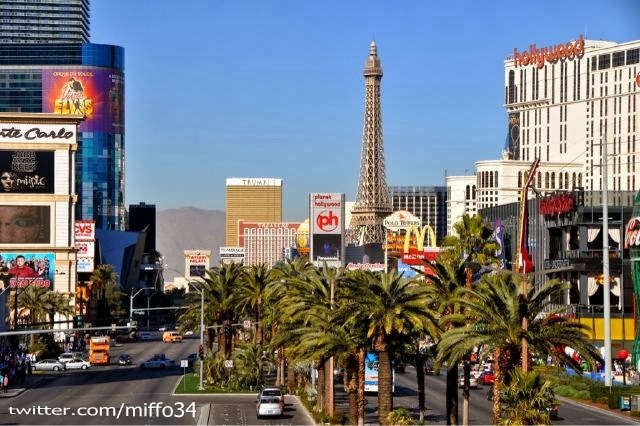 The picture gives you a great look at a cloudless Vegas sky while grabbing a little bit of several Vegas properties. He did a good job of capturing what you actually see from this vantage point and not what your camera captures. It’s a great picture and we are thrilled to add it to our collection of “Twitpics of the week”. - Circus Circus has 3 bars with different 2 for 1 drink specials every day as well as $1 Hot Dogs during pro football games. Rock & Rita's, Sports Bar & Bus Bar. This week's winning picture goes to @crashrick for his picture of Caesars Palace. The photo appears to have been taken at dusk which provided just the right amount of background light to help the foreground exterior lighting really pop instead of glow into a blur. 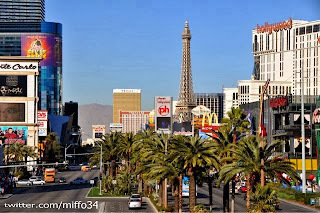 Anyone who has tried to take pics at night in Vegas knows what I’m talking about. 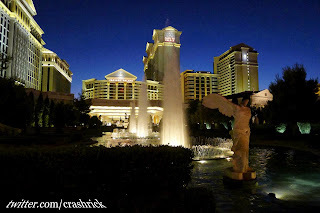 It’s a great picture showcasing the fountains as well as the various Caesars towers. Caesars new "All You Can..."
While supplies last, Rio is offering free shot glasses when you buy a 750ml bottle of booze from the Logo Shop.